Lee Zimmerman crosses McCormick Ridge on the south end of Chimney Rock drainage on what became the last day of the first leg of the trip. The group had to retreat to Upper Pack River when a storm blew in later that day. The group stops for lunch on the north end of Flat Top with Jeru Peak in the background on the second day of the first leg. 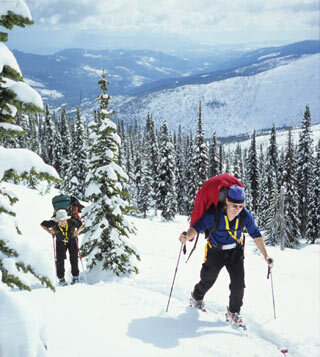 To some, the winter season means finding adventure by taking a stroll down the block in the freshly fallen snow, making snowmen or going sledding, but for others it means setting out on a 50-mile backcountry ski touring and winter camping expedition from their backyard. Backyard? Why, yes! “The most rewarding part of the trip was experiencing the Selkirk Mountains and all in our backyard,” said Lizbeth Zimmerman, wife of Chris Park, who lives close to the summit of Bald Mountain, which is part of the Selkirk Crest west of Sandpoint. Park is the owner of Misty Mountain Furniture and grew up skiing in Colorado, where he was active in the Junior Colorado Mountain Club. He came up with the idea for the trip in the Selkirk Mountains. The route was red lined on detailed, laminated topographic maps, but the Selkirks would throw a few curve balls at him and the adventurous individuals that joined him on the expedition. “As it turned out, we did vary off of the route some. The topo maps can make something look easy, but when you get there on the ground, it is a cliff,” said Park. After several logistical meetings, recon trips earlier in the winter to inspect potential routes and hiding a food stash near Harrison Lake, Park, Zimmerman, John Edwards and Woods Wheatcroft set out from Schweitzer Mountain on Feb. 29, 2004, intent on making it to the headwaters of Bog Creek, just south of the U.S.-Canada International Border. The journey would take them 62 miles northward through some of the most rugged terrain in the United States. The group was equipped with the lightest of shelters (a floorless, pyramid-shaped tent), freeze-dried foods, alpine touring ski equipment, climbing skins and lightweight stoves. They expected to make between 7 and 10 miles a day. “We had pretty good traveling conditions the first day,” said Park. It was snowing and deposited three more inches onto the base. On their first day, they made it past Blue Mountain, Keokee Mountain, Mount Casey and eventually to their first camp on the slopes below Flat Top Mountain. The next day, the group skirted to the west of Jeru Peak to save some time. A highlight was seeing wolverine tracks, but Park noted he was amazed at the amount of use the area was getting from snowmobiles. Two more miles northward, they made it into the upper headwaters of McCormick Creek and their second night high up in the Selkirks just to the east of Hunt Peak, at 7,058 feet. On day three, they would find a crux in their trip, McCormick Ridge, that presented cliffs on the ridges on the east and west sides of the crest, in addition to the cliffs on the crest. “This was one of the toughest sections of the trip just to get through here. It is pretty much impossible to truly stick to the ridge between Gunsight Peak and Silver Dollar Peak. It is just too cliffy,” Park said. At a pass at about 6,000 feet on McCormick Ridge, the entourage of four tried to find their way northward. After they sidestepped a little, trying to find a way from the predicament, another big chunk of snow took off like a rocket. Ironically, Zimmerman said many members in the group had just called their relatives and family members to tell them they were having a great time and that the trip was going well. “It goes to show you, your whole world can change in the blink of an eye,” she said. After self-reflection on proceeding, the group decided to ski out to the Pack River, in hopes of making it around McCormick Ridge and continuing on the next day by skiing up the road to Harrison Lake. Chris Park leads Lizbeth Zimmerman on the southeast aspect of McCormick Ridge on day three of the first leg. But that night, Mother Nature showed up with snow, snow and more snow. Knowing what they did about the avalanche conditions and wanting to adhere to their goal of staying on the ridge, the group decided to ski down the Pack River and come back when snow conditions were safer. “Our mistake was starting out a little early in the year,” Park said. He recommended anyone wanting to follow in his ski tracks to try the trip later in the year around late March and early April, depending on the snowpack. With hopes of finishing the route from where he left off after the first departure date, Park returned with Travis Harmon – a Midwest transplant who also has a passion for the ’kirks, backcountry skiing and finding powder stashes – for the second leg of the trip on March 21. 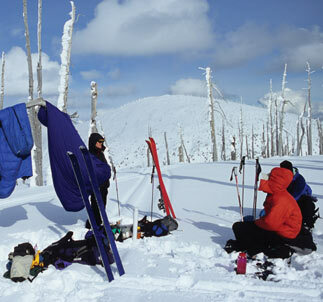 They climbed to the flanks of Silver Dollar Peak and camped at over 6,800 feet. “We had some exposed rock and dead trees, it was fairly warm out, and we had a campfire that night up on the ridge. It was truly a special night,” said Park. The two adventurers set out the next day and barely had to use their climbing skins. “You could contour and skate this section,” Park said. After a bit of route-finding through several cliff bands, the two of them made it to Harrison Lake on this two-day phase of the trip. Park hoped to return with Edwards, who was in the original group of four, and continue on. After taking a break while being shuttled into Harrison Lake with a snowmobile on April 5, Edwards came to the realization that he had forgotten his climbing skins. But with some creative use of ropes, he and Park improvised by making some rope skins. Edwards trudged on for the next four days past Myrtle Peak, next to mountain goat tracks near The Lion’s Head, north on the ridge to Abandon Mountain and eventually to West Fork Mountain. Park and Edwards made it through several icy sections near Abandon Mountain but ended up making a “famous last words” shortcut to Smith Creek. “The bushwacking was hellacious,” he said. But after an 11-hour, fun-filled day of skiing dangerous terrain, battling brush and slogging out down the road in sloppy snow, the two made it to the vehicle Park’s wife was waiting in on Smith Creek. The trip was cut short by 12 miles, but last summer Park was in the planning stages to finish the trip north to the Canadian border this winter season. And possibly in the future, after making his way through the Canadian Port of Entry legally, he will continue on northward in the Canadian Selkirks. The one thing he wanted to pass on to other potential Selkirk Crest route followers is to “maximize your fun” by being efficient with light equipment but also taking enough amenities to be comfortable.